Service was a bit stand off-ish and I got serious "tourist trap" vibes, but my group wanted to eat so I stayed. While we were waiting for our food, we watched the waiter clean up after other guests -- by removing their plates and adding new glasses, no wiping or cleaning. The food was nice, but the portions were small, especially considering the price. Overall, it was fairly decent, but definitely not worth the price. Some of the "offers" are the same price as the dish normally. I was still hungry when I left! This is one of the BEST RESTAURANTS I'VE EVER BEEN TO!!!!! one of the worst restaurants i have ever visited. originally wanted a simple penne arrabiata and was advised on trying out a similar style dish but with chicken, so what the hell, until it arrived...cheap awful smelling chicken with breadcrumbs with a luke warm pile of pasta with a mild tasteless sauce . this was obviously an upgrade tactic as i heard the frantic waiter offer this to every table in the place, regardless if they even asked for a pizza. Travelled up from Bristol to see some football and was looking for a decent alternative to the usual station grub. 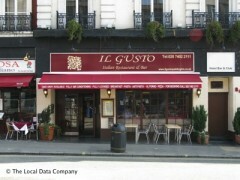 Enter Il Gusto a couple of minutes walk from Paddington. My son ate the whole of his pizza so it must have been good, and my pasta was tasty and freshly cooked. Polite and helpful staff who stopped to have a chat and were really friendly. Good selection on the menu, nice atmosphere and reasonable prices too. Would recommend, and we will be back. We also won the game. Starting with the positives - the house wine was great, the starters were nice, the actual restaurant is vaguely Italian themed & the toilets get a thumbs up. However 5 out of 6 main courses were served lukewarm to cold & despite 2 of them being sent back to the kitchen to be heated up again, noone apologised, noone asked if everything was okay with our meals. To top this the mixed grill contained under-cooked chicken & over-cooked beef and the tiramisu was more 'cheapest own label' than 'genuine Italian'. In summary, probably the worst Italian restaurant I've tried in London. Had an hour to kill before taking the train to Bath,very tasty pizza,friendly and efficient staff, happy,relaxed atmosphere.